Aberdeen missed the chance to go top of the Scottish Premiership for the second time in five days after they drew a blank at home to Partick Thistle. The hosts' Graeme Shinnie hit the crossbar in the first half, but most of the action came after the interval. Kenny McLean and Niall McGinn forced good saves, and Peter Pawlett beat two Thistle men before a shot was blocked. As the Dons piled forward, Shinnie was denied from point-blank range and Adam Rooney shot wide late on. The result means Aberdeen go level on points with Celtic, but Derek McInnes' side have an inferior goal difference and have played two games more. The Dons produced a disappointing performance on a night when they could have gone clear at the top with a win. They were flat for long spells in last Saturday's draw with Inverness Caledonian Thistle and they struggled to make much headway against the Glasgow Jags as well. Shinnie did send a shot crashing against the crossbar in the first half and Jonny Hayes posed a real threat with some direct wing play. But Partick Thistle have now gone six games unbeaten and the organised way they defended was ample evidence of why that is the case. 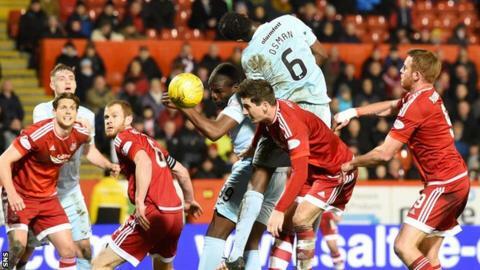 Aberdeen did mount a late rally to try to make the breakthrough but Shinnie could not make the most of a late chance to score in a packed penalty area. Then a clear sign that it was not going to be the Dons' night came when top scorer Rooney miscued from just six yards at the death. In fact it could have been even worse as the visitors made a couple of late chances themselves only for Stuart Bannigan and substitute Mathias Pogba to fire wide. Now Aberdeen will be hoping Thistle prove just as tough to beat when they go to Celtic Park on Saturday. Match ends, Aberdeen 0, Partick Thistle 0. Second Half ends, Aberdeen 0, Partick Thistle 0. Attempt missed. Abdul Osman (Partick Thistle) right footed shot from outside the box is high and wide to the right. Substitution, Partick Thistle. David Wilson replaces David Amoo. Attempt blocked. Peter Pawlett (Aberdeen) right footed shot from outside the box is blocked. Attempt missed. Mark Reynolds (Aberdeen) left footed shot from the left side of the six yard box misses to the left following a corner. Corner, Aberdeen. Conceded by Danny Seaborne. Steven Lawless (Partick Thistle) wins a free kick on the right wing. Attempt missed. Mathias Pogba (Partick Thistle) left footed shot from the left side of the box is close, but misses to the right. Substitution, Aberdeen. Cameron Smith replaces Niall McGinn. Attempt missed. Stuart Bannigan (Partick Thistle) right footed shot from the right side of the box is just a bit too high. Corner, Partick Thistle. Conceded by Mark Reynolds. Corner, Partick Thistle. Conceded by Ash Taylor. Substitution, Partick Thistle. Mathias Pogba replaces Ryan Edwards. Attempt saved. Peter Pawlett (Aberdeen) right footed shot from the centre of the box is saved in the bottom left corner. Corner, Aberdeen. Conceded by Callum Booth. Attempt saved. Kenny McLean (Aberdeen) left footed shot from outside the box is saved in the bottom right corner.